I have a new LED ceiling light fixture that I got to replace an old T12 fluorescent light in our kitchen which stopped working. 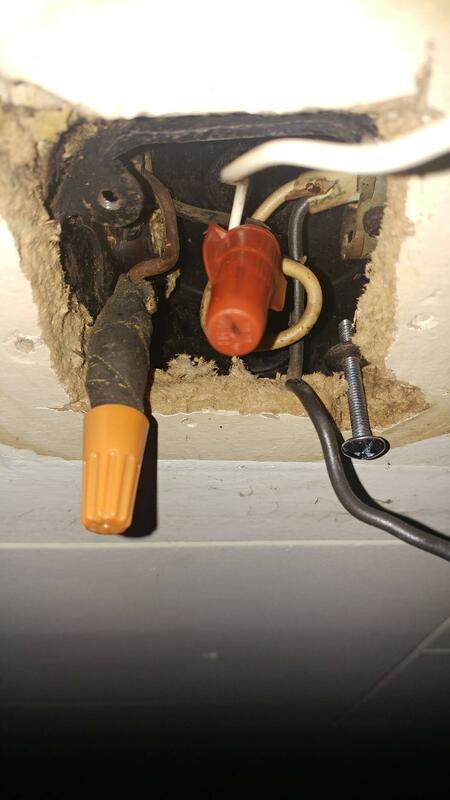 After turning off the breaker, verifying that there was no power to ceiling fixture with a voltage pen, I removed it noting that it was only connected to a black wire and a white wire in the ceiling box. New light has white wire, black wire and a ground wire. I connected the white wire to white and black wire to black, but am now stumped on where to connect the ground. The LED does get voltage as the no-contact pen lights up when I switched the breaker back on (yes, I was careful not to touch the fixture when it did that). 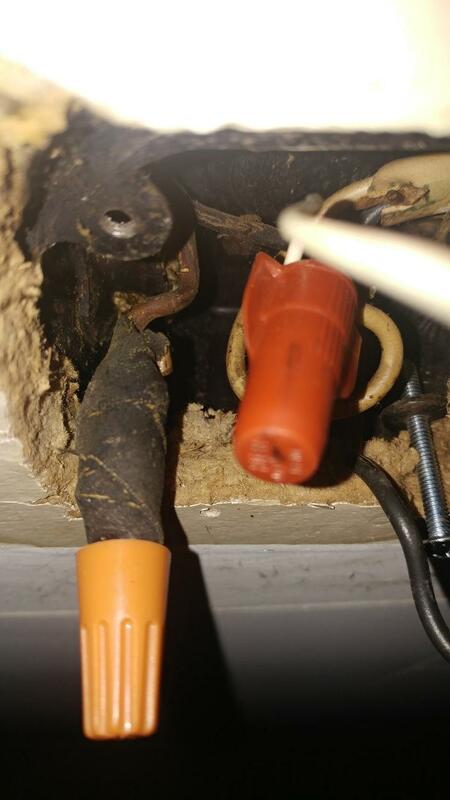 I've enclosed pictures of the junction box (1st & 2nd pictures) as in there I see a white wire spliced to a black one (red wire nut), plus on the right side of the junction box are what looks to be a black wire and a dark brown one - unless that's just discoloring from age - wrapped in some black cloth tape (orange wire nut). Tell me what I'm doing wrong and thanks in advance for any help. The cable entering from the left is just old wire whose marks have faded or was never polarized in the first place. I'm not worried about that. Pretend one is white and one is black. The box is entirely ungrounded and the old Romex cables do not have a ground wire. Again, not worried about that. Just leave it dangle. It's not that I don't like grounds, this is just a pretty low priority as it's unlikely to be touched by humans, and is probably going to be in a GFCI envelope anyway. What concerns me is it doesn't look quite right for a switch loop. It looks like there's only one wire on the orange nut, which us weird. Which makes the red wire nut seem superfluous. Just rubs me wrong is all. 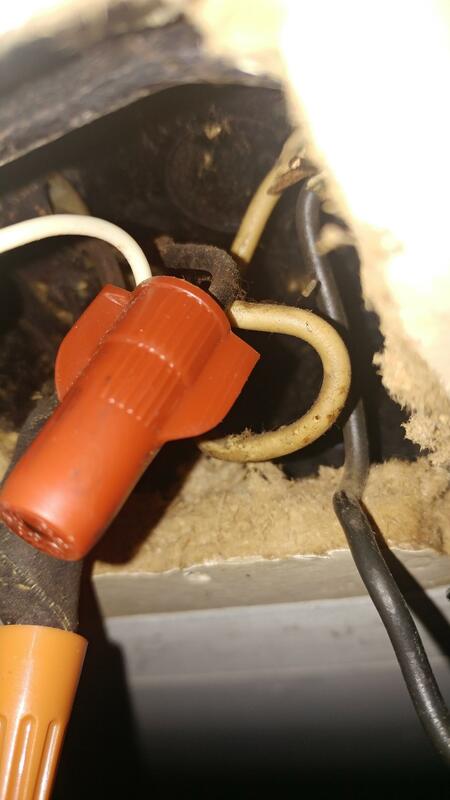 Nonetheless, the worst mistake you can make is take apart wire nuts or wires other than the two conductors (and ground if present) that directly lead to the old lamp. Are you sure you didn't pull a wire out of the orange nut and put it back on the red nut? Does the switch still turn the light on and off? does power enter this box even with the switch off? Was there ever a second light location also controlled by this switch? Is that dark wire just bare copper? If it is, then that is likely your ground. The white/ black splice is very concerning, but my guess is that someone ran Romex to your single pole switch, not a big deal other than that it is not labeled. The problem with this guess is that the switch should be on the hot side/ black/ positive, which more often leads to one white wire into a nut of black, the opposite of what you have. I would pull out the switch to find out what is going on there, if there is a white and black on a single pole switch and things worked, the scenario I described is likely. It may be possible to have a switch wired to the neutrals, I’d have to check on that, but I know that is not how it is ‘supposed’ to be done. If a single pole switch is wired to your neutrals, I would double check that your breaker(s) are off, get out the multimeter, label wires as you pull them apart, turn on your switch, and test for continuity until you determine which wires are running to/from the switch, then put those wires back, but on the appropriate points of the hot side. You need to make 110% certain that there is not some other strange junction where those wires are tied with another system before deciding to do this. The last thing, when in real doubt, hire it out. Agreed with Keil above on his concerns in #2, so I'd check the switch wires to see what was done via Romex or Whip/BX. Some Whip/BX only have 2 wires and are used for switches and the installer chooses the colors to use incorrectly sometimes. You can however use the box itself as the ground because this box eventually is connected to the panel for the house and itself is grounded to the water pipe entering the house usually. And really, why are you bothering with turning off the power for the circuit - you people don't like working with live power? You don't like to live on the edge, do you? Kidding. Not the answer you're looking for? Browse other questions tagged electrical wiring ceiling light-fixture or ask your own question. Ceiling light not turning on?